The first page of my new favourite picture book shows enormous city buildings that dwarf scurrying ant-like people. How much smaller and insignificant then is the pigeon that thuds against the glass wall of one building, and falls to the street below? Is it any wonder the grey and unremarkable city folk ignore it? Until Will comes along in his bright red jacket and sees a bird with a broken wing, and the feather lying next to it. 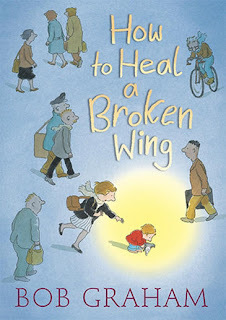 How to Heal a Broken Wing (Walker Books 2008) was written and illustrated by Australian author, Bob Graham. It is truly a special picture book, and one that will appeal to all ages. Graham's illustrations are superb. I can practically hear Mum's consternation : what am I supposed to do with an injured bird? But she wraps the pigeon in her scarf and they take it home in her handbag. I'll just bet there are other mums like me who have capacious bags so handy in emergencies, nodding ruefully over this page. Mum and Dad help Will look after the injured bird. The story is told with no unnecessary words or details. It's spare, but perfect. Graham allows the pictures to do most of the talking. Some pages have multiple panels, others have a double spread, but all use colour and style and detail to contribute to the story. Just when I think Graham's beautiful watercolour images are the most outstanding feature of the book, his words win me over. We live quite close to a national park, and often rescue birds that have crashed into a window when the sun is at the wrong angle. I've been told, "Let nature take its course." and "What possible difference can one bird make?" My answer always echoes the starfish story - "It makes a difference to this one." I believe we should encourage our kids to be compassionate, and give free rein to our own compassion, despite its inconveniences. Reaching out to others, especially those smaller and weaker, makes a brave splash of red in a sometimes grey universe. How to Heal a Broken Wing is obviously destined for school and local libraries. It will make a tremendous resource for environmental themes, personal development lessons, or a study of visual text. The book has already been short-listed for a 2009 Early Childhood CBCA award. My prediction is it will win. It's already won a slew of other awards, like a Cybils and a Charlotte Zolotow award. But don't get this finely-crafted picture book because it's won awards. Buy it and share it with your child because it is a beautiful story about healing, and a beacon of hope in our tumultuous world. Book Chook Alert: This review is my entry into the May 2009 Carnival of Children's Literature. You can see many wonderful entries at Tarie's blog, Into the Wardrobe. Oh, it sounds lovely. I'll have to look for it. Great Corey, and this one I know you can get in the USA. Compassion is so important and yet, in all the hustle and bustle that we create for ourselves, it often gets pushed to the side. Chidren are innately and instinctively compassionate- we need to praise and encourage this. Sounds like an excellent book. Thanks for the great review! I agree, Lucy - sometimes compassion can be quite inconvenient, and I well remember times in my life when I have squelched it. But our world needs all the compassion and tolerance we can promote. I agree! Compassion and tolerance are the keys to the future. I teach these lessons to the students in my classroom and I know, if nothing else, they will at least have that dichotomy as they go through life. This sounds like a book I need to pick up and read and see how many life lessons it can teach both kids and adults! How old are your students, Rebecca?